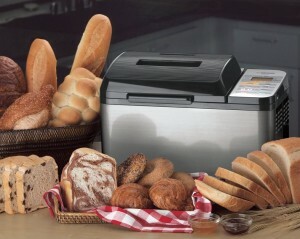 These two bread machines are for the serious home, bread maker. They offer an interesting list of features and some unique modifications. Both bake a horizontal loaf and use a two kneading paddle system. Of note is the Breadman two 1-pound loaf option. Because it has two spindles for two paddles they offer an additional two bread pans in a 1-pound size to allow you to bake two 1-pound loaves simultaneously. The Zojirushi also has a unique feature with its top browning element which promises a crispier, browner crust. Both machines feature two paddles and both companies like to tout the ability of the two paddles to full knead the bread in a more complete way. What they neglect to mention is that two paddles are necessary for a horizontal loaf pan. If you tried to knead dough in a horizontal pan with a single paddle the flour would continually collect in the corners of the pan because the dough ball would have limited contact. This would be especially true for a 1-pound loaf. In fact there were complaints about both machines delivering lopsided 1-pound loaves because of the continuing tug-of-war between the two paddles. The Breadman also features two collapsible paddles to reduce the size of the holes left in the bottom of a loaf formed by the paddles after baking. There were no complaints about the collapsible paddles failing to properly open and collapse like some other collapsible paddle machines, but replacing the paddles when lost or broken resulted in a deluge of complaints related to customer service. The biggest complaint was the inability to order a replacement paddle when one was broken or lost. These complaints dovetailed with general complaints about Breadman related to any customer service. Here are the functional details about both machines and then we’ll do some comparison modeling on features and benefits. Zojirushi BB-PAC20 Home Bakery Virtuoso® Breadmaker is one of the top-of-the-line breadmakers on the market from a company that has been in operation for almost a century. Featuring a unique top-browning feature and two kneading paddles, the Home Bakery Virtuoso bakes a consistent loaf every time. Preprogrammed with 3 crust shades and 10 settings including: Basic, Basic Wheat, Basic Dough, Quick, Quick Wheat, Quick Dough, Jam, Cake, Sour Dough Starter, and 3 homemade menu options. 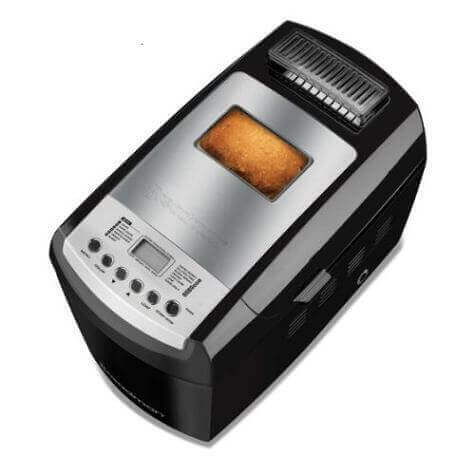 The control panel is integrated with a digital clock that will allow you to set a timer to bake your bread up to 13 hours in advance. Both of these machines offer robust features and unique benefits. The ability to bake two 1-pound loaves at the same time with the Breadman is interesting, but the type of loaf has to be very similar because you can only select one setting for both loaves. This means you can’t add gluten-free ingredients to one pan and high-gluten bread flour to another and expect a good result. Those settings have unique features although if you wanted to try to you could select gluten free with it’s extra kneading and rising cycles and might get a good result with a standard white bread recipe in the second pan. Zojirushi’s unique benefit is the top-browning feature. This typically isn’t a problem depending on how you choose your crust setting. Most machines offer a light, medium and dark crust feature, but with a horizontal loaf this could be un-even. If a consistently crispy, dark crust on a horizontal loaf is important to you Zojirushi will give you that result. This was perhaps the biggest differentiator between the two machines. Zojirushi has an excellent instruction/recipe book and very good customer support according to current owners. Unfortunately, Breadman had very poor reviews from owners due to recipes that were simply wrong, and a very difficult time ordering the collapsible replacement paddles and other support issues. 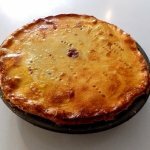 You can always compensate for a poor recipe book by using recipes on our website that have been kitchen tested, or pursue other recipes on the Internet. If you have a problem ordering a replacement paddle with the Breadman, you’re on your own. Both of these machines are large and heavy. This is mostly due to the horizontal loaf shape. The weight actually has a benefit in that it will not walk across a counter due to vibration during the kneading cycle. However, pay close attention to the physical size of the units. If you have limited counter space or low hanging cabinets you may not have a permanent place for these machines. The Breadman also allows you to bake up to a 2.5-pound loaf while the Zojirushi has a 2-pound maximum. The Breadman has 13 setting while the Zojirushi has 10 settings plus 3 optional settings you can customize. Customized setting appeal to more advanced bread machine bakers while 13 settings on the Breadman should be more than enough for the everyday bread baker. Both of these machines deliver excellent results with robust features. Some of the unique benefits such as a fruit and nut hopper on the Breadman versus a top browning element on the Zojirushi is up to you. If you feel you will be highly dependent on the instruction book and need support Breadman will not satisfy you and Zojirushi will exceed your expectations. Most experience breadmakers seem to be very happy with both machines. Just hope you don’t need a replacement paddle for your Breadman and can live with the 3-foot powecord on the Zojirushi.